The findings are the first example of electrical brain stimulation in humans giving an event-specific boost to memory lasting more than a few minutes, Emory neuroscientists say. Stimulation of the amygdala did not result in emotional responses or elevated heart rate, and was not detected by study participants. Illustration of amygdala by Bona Kim. The results were published Monday, December 18 by PNAS. The findings are the first example of electrical brain stimulation in humans giving a time-specific boost to memory lasting more than a few minutes, the scientists say. Patients' recognition only increased for stimulated images, and not for control images presented in between the stimulated images. The experiments were conducted at Emory University Hospital in 14 epilepsy patients undergoing intracranial monitoring, an invasive procedure for the diagnosis of seizure origin, during which electrodes are introduced into the brain. "We were able to tag specific memories to be better remembered later," says co-first author Cory Inman, PhD, postdoctoral fellow in the Department of Neurosurgery. "One day, this could be incorporated into a device aimed at helping patients with severe memory impairments, like those with traumatic brain injuries or mild cognitive impairment associated with various neurodegenerative diseases. However, right now, this is more of a scientific finding than a therapeutic one." "We see this as a platform for the further study of memory enhancement," says senior author Jon T. Willie, MD, PhD, assistant professor of neurosurgery and neurology at Emory University School of Medicine. "The time specificity enables a lot of other experiments, since we know that there's not a carry-over effect from one image to the next." Deep brain stimulation (DBS), with current delivered continuously by an implanted device, is an established clinical method for the treatment of movement disorders such as Parkinson's disease, and is being tested for psychiatric conditions such as depression. In contrast with DBS's invasiveness, researchers elsewhere have experimented with non-invasive electrical stimulation as an approach for enhancing memory or cognition, with several rounds of stimulation applied while learning. "The advantage of DBS is that it can selectively modulate a specific brain circuit without broad off-target effects," says Willie, who performed surgeries on patients in the study. The amygdala's key roles in emotional responses and fear-associated learning have been well-studied. So the Emory scientists made sure that amygdala stimulation at low levels of current (0.5 milliamps) did not result in emotional responses, an elevated heart rate, or other signs of arousal. Study participants reported that they did not notice the stimulation at any point in the study. The researchers avoided direct stimulation of the hippocampus, figuring that would be too close to the machinery of memory itself, like introducing a live wire into a computer's motherboard. "We chose the amygdala because of decades of research in rodents, showing that it interacts with several other memory structures in a modulatory role," says co-first author Joseph Manns, PhD, associate professor of psychology. "We wanted to stimulate its endogenous function, which we think is to signal salience -- something standing out -- so that specific experiences are remembered in the future." Manns and his colleagues had already shown that electrical amygdala stimulation increases rodents' ability to recognize images later. The human experiments were designed to closely resemble how his lab's tests with rodents were set up. Study participants first viewed 160 neutral objects (emotional faces were excluded, for example) and were asked to judge whether the objects belonged indoors or outdoors. For half of the images, participants received stimulation for one second after each image disappeared from the screen. They were quizzed on half the stimulated images and half the unstimulated images immediately, and the other half the next day. 40 new images were used as decoys. The effect of stimulation on immediate recognition was not statistically strong. However, the next day, the effects on stimulated images were clear. 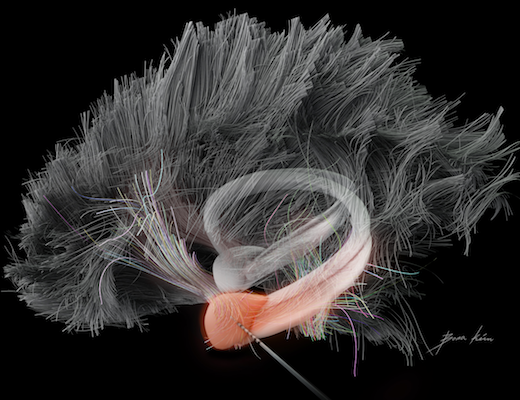 "This makes sense because the amygdala is thought to be important for memory consolidation - making sure important events stick over time," Manns says. Some of the patients had impaired memory as a result of their epilepsy; the patients in whom a greater effect was seen generally had poorer baseline memory performance. For instance, one patient essentially forgot all of the control images, but maintained good memory for the stimulated images. However, a substantial effect was also observed in people who had an average memory to start with. "The average was like having a 'B'-level memory performance move up to an 'A'," Willie says. The researchers were also able to see signs of the previous day's stimulation, in terms of electrical interactions within the brain, when those images were viewed again. The Emory team is now fine-tuning amygdala stimulation parameters, so that memory enhancement might be optimized. They are beginning to look at other types of memory tests, such as spatial or verbal tasks, as well as tasks that more closely mimic memory for real-world events. "We want to understand the brain's endogenous mechanisms for memory modulation better before moving ahead with a device," Manns says. Emory co-authors include neurosurgery instructor Kelly Bijanki, PhD, professor of psychology Stephan Hamann, PhD, associate professor of neurology Daniel Drane, PhD, assistant professor of neurology Rebecca Fasano, MD, and Robert Gross, MD, PhD, an Emory neurosurgeon who performed some of the surgeries. Other co-authors are David Bass, MD, PhD, now at the University of Washington, and Christopher Kovach, PhD, at the University of Iowa. The research was supported by grants from the National Institute of Neurological Disorders and Stroke (R01NS088748), the National Institute of Mental Health (R01MH100318, F30MH095491), and the National Center for Advancing Translational Sciences (KL2TR000455).